Starting the year off, a longer poem of mine has been published in the newest issue of the South Florida Poetry Journal. There’s also an audio recording if you’d like to hear it aloud and follow along. 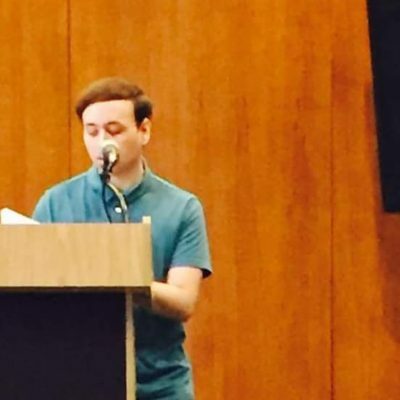 The editors invited me to do a reading – my very first reading anywhere – at the Broward County Library. I don’t like public speaking and I was nervous, but I think it went well. 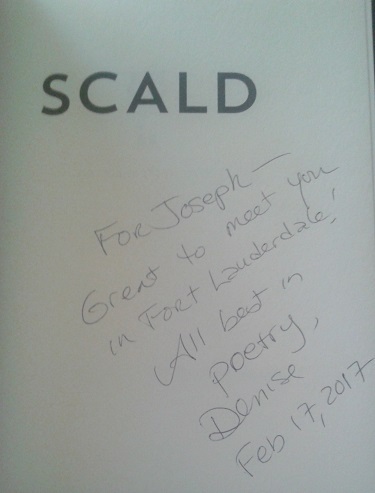 I met poet Denise Duhamel and she signed my copy of her latest book. She was funny and full of infectious energy. She teaches poetry at my alma mater and was trying to convince me to pursue an MFA. I still think about it from time to time. More good news: I was recently named a finalist for the 2016 Lascaux Prize in Poetry. My poem will be published in an upcoming anthology alongside the other finalists and winner. The poem was inspired by “A Chinese Banquet” by Kitty Tsui. Please do yourself a favor and read her work. Her poems are coming back into print soon, which I’m very excited about. I’m working towards a full-length collection and have figured out its structure. It’s helping to push me forward, along with a fresh spreadsheet keeping track of all my rejections/acceptances. I’m hoping these neuroses turn into something I can eventually hold in my hands and hug to my chest.